Please go to the "Available"
Page to see what we currently have! We are proud to breed champion bloodline AKC Chihuahuas. All of our Chihuahuas are either Champion Sired or have Champion Bloodlines. Our champion bloodlines include: Burgundy, Hi-C, Davishall, Ouachitah, Dartan, Weaver's, Regnier, Cam's, and Hurds to name a few. Why are Champion Bloodlines important? All puppies are cute, but they are only puppies for a short time, and most of their life will be spent as an adult. Genetics will tell you if your cute puppy will be a beautiful adult. This is the reason you always want to see the parents and their pedigrees and why it is important to have Champion Bloodlines! Each and every one of our Chihuahua Dreams Chihuahuas are either sired by Champion Show Dogs, or have pedigrees filled with top champion bloodlines. Not only will you get a gorgeous puppy, but a gorgeous adult as well. I am Lauren Jaime, owner of Chihuahua Dreams. This page is dedicated to letting you know about me and how I breed, raise, and take great care of my Chihuahuas. We have around 6-8 litters of chihuahua puppies for sale per yer and strive for the highest quality over quantity. All of our adult chihuahuas are in the 3.5-5 pound range and so our puppies are genetically very small as well. 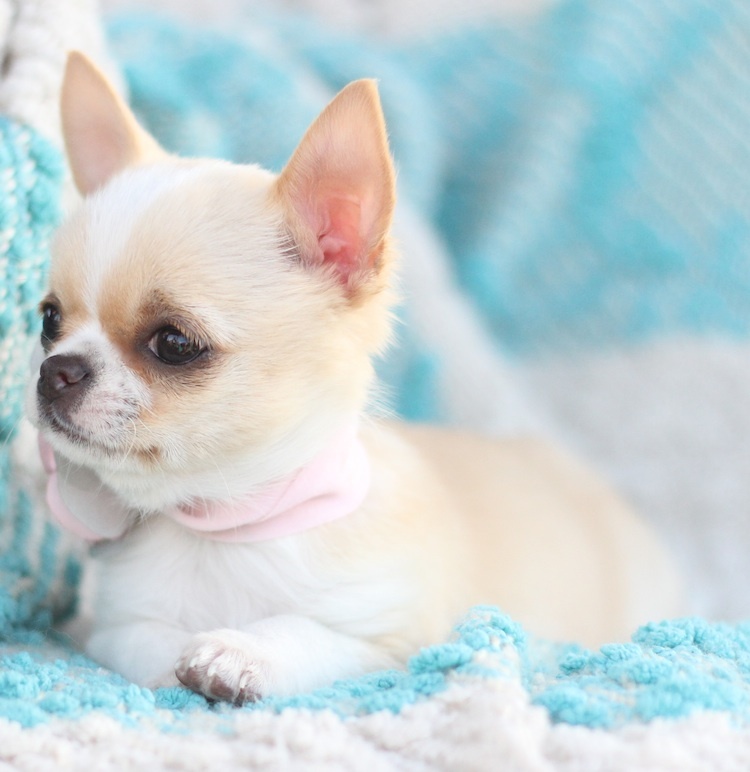 Some people refer to these teeny tiny chihuahuas as "teacup chihuahuas", however this is just a term used to describe an ultra tiny chihuahua. Not only are our chihuahua puppies ultra tiny, they have exceptional conformation in accordance with the chihuahua breed standard and wonderful, sweet temperaments. I have spent my entire life caring for animals, but mainly chihuahuas. I have been a hobby breeder of beautiful chihuahuas for over 10 years now, but in the last few years have only been breeding AKC chihuahuas with the goal of bettering the breed. All of our animals are part of our family and we treat them as such. We strongly feel that no pet can learn any more or any less than the new owner takes time to teach them. Our dogs are our entire life. Our biggest goal is to place each one into a loving, caring, proper environment with the right family. We have placed puppies in homes all across the United States and Canada. We at NO time sell to pet shops, puppy brokers, or puppy mills. If you have a specific look that you want in your chihuahua puppy please let me know. If you look through the pictures of "Our Chis" you will see that we breed typey (pronounced applehead, smaller ears, shorter nose, bigger eyes, more compact cobby bodies, etc) and as a result our puppies are really gorgeous and typey as well. All of our dogs have champion bloodlines and/or are champion sired (pedigrees of our dogs available upon request). Each breeding is carefully planned with the right sire and the right dam that we feel will produce the best quality puppies (both temperament and looks). I raise my chihuahuas indoors and they are potty pad trained. My chihuahuas are held and loved on a daily basis. When you see and hold one for yourself you will see they are very comfortable with humans. They do not nip or bark, they are not yappy, and they certainly do not bite. My chihuahuas wag their tail and wait to be picked up. My chihuahuas eat Royal Canin and I do not have any health issues with them. I believe a high quality food makes a huge difference in the health, energy and coat of a chihuahua. I would recommend Royal Canin to any dog owner. I do "free feed" all of my chihuahuas, meaning they can eat whenever they choose to at any time, day or night. Please feel free to email or call with any questions. I feel my puppies deserve to be met in person by a chihuahua lover who takes the time out to come and meet them, but I do understand that this is not always possible. A chihuahua is the best friend you will ever have. I can't wait for you to meet our beautiful babies. Thanks for visiting our website.
. Please visit the "Available" Page of our website to view pictures and information about these puppies. Our puppies are adopted quickly, so if you see one that you like please don't hesitate contact me.